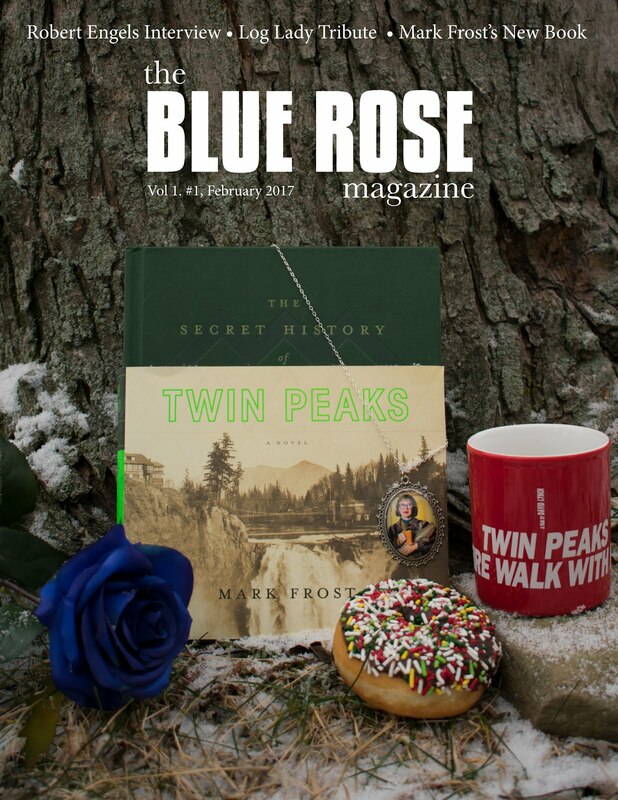 For 13 years I was co-editor of the Twin Peaks fan magazine, Wrapped In Plastic, where I wrote extensively about that series and other works by David Lynch. I have a Bachelor of Science in Technical Communications and I hold a master’s degree in television production from Southern Methodist University in Dallas, where I wrote my thesis on narrative theory and the TV series Homicide: Life on the Street. Frederick Elmes was cinematographer on three David Lynch feature films (Eraserhead, Blue Velvet, Wild at Heart) and one short film (The Cowboy and the Frenchman). In the fascinating documentary about cinematography, Visions of Light, Elmes explained: “My job [on Eraserhead] was to find ways to extract [the film from David Lynch’s mind], to have him explain how it should look in great detail.” Together, Lynch and Elmes have produced some of the most memorable images on film: The puzzled/awed face of Henry (Jack Nance) before a field of swirling sparkles (Eraserhead); the voyeuristic face of Jeffrey (Kyle MacLachlan) as he spies through closet louvers (Blue Velvet); the elegant, surreal appearance of Sandy (Laura Dern) on a shadowy sidewalk (Blue Velvet). These are images which mesmerize. These are images which demonstrate the unique artistic power of film. Craig Miller and John Thorne interviewed Frederick Elmes on June 29, 2000. The full interview appeared in Wrapped In Plastic #48 (August, 2000). The following is a small portion of that interview covering Elmes’ work on Blue Velvet. 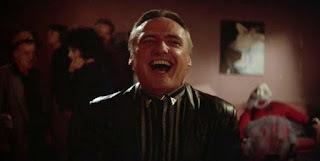 Thorne: Blue Velvet is memorable for its sharp and vibrant colors (the roses and fence, the fire truck). It also made powerful use of shadow. One of the film's most memorable scenes is when Sandy (Laura Dern) emerges from total darkness--and she's wearing a light-colored dress! Elmes: [Laughter] Yeah, that was a good trick! JT: Did you find scenes such as those particular challenging? FE: They were good. They were great. I certainly hadn't done that exact thing before. David had a very specific thought in mind, that she really had to come out of the darkness, so what you see in the background is the willow tree blowing in the wind, and she just seems to appear out of it. But again, it was something we could do in the camera and not do as a trick. We just did it with the lighting, and make her look beautiful at the same time, because that's her first moment with Kyle [MacLachlan]. It was a very cool moment; I liked it a lot. JT: Was it a problem that needed experiments to solve, or did it turn out to be fairly simple to accomplish? FE: It was fairly simple to do once we came upon exactly what David wanted, once David could describe the mood of it. It was pretty easy to do, and very, very effective. That, and the music together, and the sound, really did it, really made it a beautiful moment in the film. JT: There's another great scene when Dean Stockwell sings into the prop light. We understand that was not originally intended. Is that true? FE: Right. It seems to me that it came out of scouting a location when we were trying to determine who stands where, and which direction we'd be looking in the room. And somebody in the art department picked up this light as a prop microphone and said, "Okay, does he stand over here? Does he stand over there?" And I think that's kind of what it came from. David decided it was a great idea, and we would use that. It turned out to be perfect. Stockwell picks up the light and sways back and forth to sing the song, and in fact what you see is a little trick, actually, because his shadow on the wall behind him is not his real shadow. It's an electrician back there with a little paper cut-out making the shadows rock back and forth on the wall. We couldn't do it for real, so we did it with pretend shadows. It worked well. JT: On a major film, are you often improvising the look and lighting on set, or are things usually planed out? FE: Certainly there's a mood and a tone to a film, which is set in the beginning, and which you want to be consistent to. It is, in a sense, like making a painting--you have different parts of the painting, and different parts require slightly different techniques or different feelings, but it's still one painting. And so you go into a film with one vision of how it will be, and in a sense every scene is an improvisation on that theme. So every scene requires a little different handling, even if you're coming back to the same room again and again, like Dorothy's apartment [in Blue Velvet]. It transforms; it changes character a little bit. Depending on whether it's daytime or nighttime, depending on what action is happening, the mood in the room changes. We set up what we wanted it to feel like, but then you make little changes and adjustments as you go to make it appropriate for the scene. So for me, the lighting, the feeling of it is driven by the actors and the motivations in the scene. JT: We actually had a question about that further down on our list, which was basically, how does character and plot influence the look of a film? 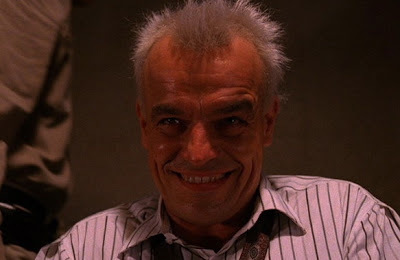 In particular, do Lynch and other directors discuss the character motivations with you, or is it something you intuit? FE: That's a funny question, because each director is really different. David doesn't often tell a lot of things about the characters. Others will tell more, but usually they're pretty tight about it. That's something that they discuss with the actors, and I think it's my job to eke out some of that information, intuit what they're thinking and get them to talk about it a little bit, because it helps me to know what's going on with the characters. It really helps me to be clear about what the motivations are in a big sense--where they fit in the story, and all that. That's very important stuff, because I think it has everything to do with the visual style. So yeah, it's important to me, and I love to spend time with the director talking about that stuff and asking lots of questions. 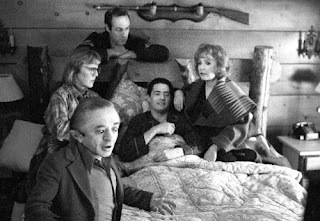 JT: In the Visions of Light documentary you mention that you and Lynch had years to talk about the look of Blue Velvet. What kind of things did you talk about? FE: For David and me the advantage was that we had already spent a few years together on Eraserhead, so some stuff started to come automatically and not have to talk about [them]. But the advantage with Blue Velvet was that there was a long genesis period. We knew the film was going to get made, we just didn't know when. The schedule changed, and things got pushed back, and we had time to talk. David had been back there to Wilmington, North Carolina, and had driven around and seen a lot of the local towns and had found one that we wanted to model our town on, so we chose the parts of Wilmington that looked appropriate. Dorothy's apartment was a certain style and feeling, and it was a different neighborhood from where Jeffrey lived, where Kyle's character lived. His was a very little street, and we knew there were lots of scenes that took place walking up and down that street, so it had to have a certain character, a certain feeling to it. Those were really important things that we could talk about in advance. JT: A case can be made that the look of Blue Velvet (the town, the community, etc.) influenced Twin Peaks. Did Lynch ever discuss any aspect of Twin Peaks with you? FE: No. I wasn't really part of that at all, as much as I like it. Certainly there are similarities in the small towns, and I know that's right up David's alley. Miller: You worked on Tim Hunter's film, River's Edge, which was released about the same time as Blue Velvet. Which did you work on first? FE: Blue Velvet was first, and then River's Edge. It was great to work with Dennis Hopper [in both films]. CM: Both times he had crazy roles. FE: Yeah, both times crazy guys. It was really a joy to work with him. It's funny, a story on River's Edge. There were a lot of young actors, and Tim Hunter's very good at casting young actors, taking advantage of people who had talent who hadn't been seen much--Keanu Reeves, and Crispin Glover, and Ione Skye--there's that handful who have gone on to keep making movies. He put them together for the first time, and so we were doing a read-through a week before we started production. All the actors showed up, and they're all sitting around the big table, and everybody's waiting for Dennis Hopper to show up. This is their hero. To be in a film with Dennis Hopper is like being in a film with James Dean, and they were all talking in hushed tones about him, and sure enough Dennis shows up wearing a three-piece suit, carrying a briefcase. It was so completely opposed to their image of him, their jaws just dropped. They couldn't quite make sense of what Dennis was up to. But Dennis was an extremely professional and very responsible actor on both films. He was a joy to work with. Professor David Lavery, well known to Twin Peaks fans as editor of the book, Full of Secrets: Critical Approaches to Twin Peaks, passed away on August 30, 2016. 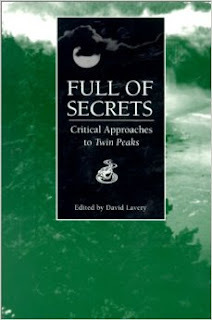 Lavery was one of the first people to bring an academic focus to Twin Peaks: He edited a special Twin Peaks issue of Literature/ Film Quarterly and then produced Full of Secrets, a landmark study of Twin Peaks that has remained in print for 22 years. Lavery went on to produce more than a dozen books of academic analysis for other well-known TV series, including Buffy The Vampire Slayer, The X-Files, The Sopranos, Deadwood, Lost, and Madmen. Although Lavery would achieve great acclaim for these later works, I always felt that his first book, Full of Secrets, was his most important. It laid the groundwork for the decades of Twin Peaks academic study to follow. When we started Wrapped In Plastic, Craig Miller and I knew that Twin Peaks was ripe for in-depth analysis and we strove to produce such analyses in the pages of our magazine. 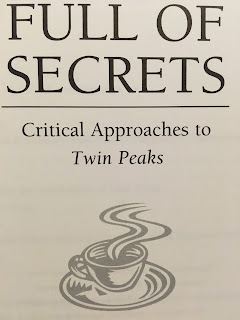 We were excited when we heard about Full of Secrets and saw that other authors and scholars were taking Twin Peaks seriously. We had a chance to meet and interview David Lavery when he visited Dallas on May 21, 1994. The following interview first appeared (in slightly longer form) in WIP 13 (October, 1994). Our talk about Twin Peaks occurred at a time when we were only beginning to investigate and fully appreciate the complexities of the series, and, as a result, some of our notions about the show had yet to fully form . . . .
Miller: When Twin Peaks first came on television what was your initial reaction? Lavery: I didn't watch it. I missed the whole first eight episodes. During those episodes I kept hearing everyone talking about it at the office; even the secretaries were watching it. They were always talking about it, and a couple of colleagues of mine were always talking about it. So, by the time the reruns started I knew I had to start watching it. I was instantly hooked. I started taping it right away. I taped all that summer as they reran the eight episodes and had my first Twin Peaks party for the premiere of the second season. I was just blown away by the opening of that show. The old bellhop and all of that--and of course that was exactly the point that the secretaries stopped watching it. I came to the office the next day and they said, "What was that?! What was that so slow for?" I think that happened to a lot of people. The opening of the second season was almost a challenge to the Twin Peaks viewership. Thorne: Do you think that might have been deliberate? DL: I don't know how deliberate it was. But all the talk was that people were disappointed because Laura's killer had not been revealed--all the disappointment in the press and outright anger about the fact that we didn't know the killer. The first fifteen minutes are absolutely endless, up until the Giant appearing. Of course, I was just fascinated with it. I like TV the most is when it is so absolutely perplexing. It certainly put up a challenge to some viewers. And don't forget, too, there were people coming in for the first time that night hoping to finally pick up on this cultural phenomenon. And what did it do? It gave them that opening. I wonder how many television sets were turned off in that first fifteen minutes? CM: I was disappointed with the second season premiere. I agree with David Bianculli who said that every time Twin Peaks needed a blockbuster episode, it fell down. It was the episode after that really excelled. DL: One of the reasons the network didn't like it, finally, is that they didn't know how to market it. Genre, as Horace Newcomb has found out over the years, is essentially a marketing tool. If they don't know what to say Twin Peaks is, then how are they going to push it? Certainly in one sense it was a soap opera, and yet if it's soap opera, it's a given that the viewer can enter it anywhere and that it exhibits a narrative redundancy. It allows you back into a series even if you haven't watched it in ten years. Twin Peaks defied that. It did some of that, but it didn't do it enough--not for somebody coming in new. CM: It seemed to be playing into the critics worst criticisms. Its bad rap was that the producers weren't really concerned about resolving the storyline. Viewers wanted some hint that they were conscious of these concerns and at least interested in moving the story ahead. DL: Cooper does get clues from the Giant, but they were just baffling utterances that you knew were going to take episodes and episodes to reveal. Again, it's a matter of expectations isn't it? If people have been watching it thinking, "this is a night-time soap" then they wouldn't have been so anxious for closure. That's the definition of soaps--they don't have closure. JT: That's the argument in Marc Dolan's essay in your book. DL: Right. Twin Peaks did a very bad job of setting up its expectations. Saturday Night Live had just been on with the parody of the show's endlessness with the suggestion that Cooper was perpetuating this indefinitely! And the network ran that ad that shows the smoke-filled room with the TV executives sitting around a table saying, "Saturday night?! You put our best shows on Saturday night?! Heads are going to roll!" The network, in self-reflexivity of modern television--the “deride and conquer” strategy that Mark Crispin Miller calls it--was making fun of itself as a peremptory strike. How could they lose? "We know we made a stupid mistake, and if it turns out to be the stupid mistake we know it is then we'll claim that we didn't do it, because we've already made fun of it!" And when they finally changed it back to Thursday night they did that Wizard of Oz spoof, "We've been in an awful place on Saturday night. That is a bad dream." JT: Although you didn't watch Twin Peaks' initial first season run, were you aware of the pre-pilot hype? The media blitz that was going on? DL: Yeah. I can remember sitting in a conference in Birmingham, Alabama and reading a big story in USA Today. I remember some big magazine articles including one in Connoisseur: "The show that will change television forever." JT: Do you think the show lived up to that hype? Do you think it has changed television? DL: Of course not. It hasn't changed TV a bit. They put on an innovative show. It was canceled. Where's the change? Isn't that what Mark Frost said, essentially? You can watch TV today and see an occasional Twin Peaks influence. You notice how it has changed the visual style. But TV is so monolithic; it seems incredibly difficult to change it. I think you could argue that The Simpsons has changed TV. But I obviously think Twin Peaks is an incredibly significant show. I have this battle with colleagues all the time. 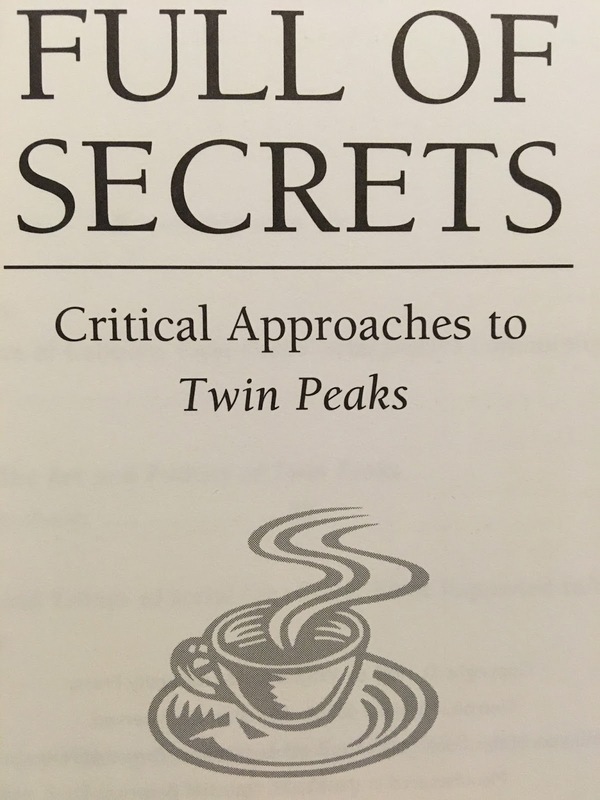 They look at me like I'm deranged: "You've done a book on Twin Peaks?!" JT: Many correlations have been made between Twin Peaks and various literary works, as was done in Literature/Film Quarterly. Since you are chairman of an English department, did you notice these allusions as you watched the show? DL: Yeah, I noticed the allusions as we went along. Of course that was part of the snob appeal of Twin Peaks. Diane Hume George, in her essay, writes quite well about that. She wrote one of the first really good articles on Twin Peaks in Ms. She says that you were just not going to associate with anybody who didn't get Twin Peaks! I can remember feeling that way. Fellini used to say about Satyricon that you should take people to it to see who was your friend. There was that kind of quality to Twin Peaks; that's part of the classic cult experience. I write about this in my essay. You want to have this group that you identify with. They're your interpretive community. You all know how to read the text. I was actually quite gratified when the secretaries stopped watching the show. It was, "I knew you couldn't get it." CM: How did you go about soliciting essays for your book? DL: When the show was canceled I had a letter out within a week. I wrote everybody I could think of. I got their addresses out of the Professional Directory. I said, "I'm going to develop a collection of essays on Twin Peaks, would you like to write something?" I got a good number of responses. 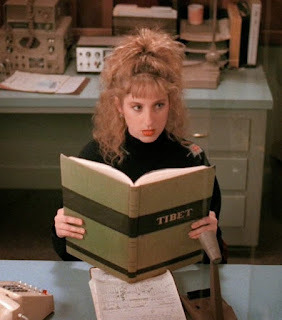 I wrote the Modern Language Association, which had 65 people who had proposed papers for a session on Twin Peaks, which unfortunately was never held. I think I got about 40 essays submitted for the book. I was the sole arbiter--I judged them. I figured out which essays would go and which would stay. A good number of essays that came in were literary in nature. I wasn't pleased at how literary they were. I knew this book was going to need a television look so it could be used in television studies classes. I think the book does have a strong television focus to it. I took the really good literary essays and talked Jim Welsh of Literature/Film Quarterly into doing a special literary issue. I actually had another one planned, a Feminist issue. I tried to talk Camera Obscura into doing that, but they didn't want to do it. JT: It seems to me there would be a lot of interest in studying Lynch's work from a Feminist approach. DL: Well there are four Feminist essays in the book. I worry that some of the essays may overlap or that there might be a little too much emphasis on the Feminist stuff. I got other submissions that I just thought were hare-brained. My favorite one was "Twin Peaks and The Fairy Queen." The Fairy Queen was an epic poem of the early Renaissance by Edwin Spencer. I thought, "This is what English people do!" But then by the end of the series we have Windom Earle and Leo in their "verdant bower" which is a direct quote from The Fairy Queen! The verdant bower is one of the famous scenes from The Fairy Queen. I thought, "I owe these people an apology!" Twin Peaks had an unbelievably rich text. It could interest people, who were semiotically inclined, on so many different levels. Even some of the bad episodes are inexhaustibly rich. Twin Peaks at its worst was still mesmerizing. CM: Getting back to the book, did you consider how the various essays would "interact" with each other, so that the book would work as a whole? DL: Yeah, I always had an overall flow for the book in mind. I knew there was going to be a Feminist core, and I wanted to have a couple of essays that set the show into the television industry. I thought Dolan's essay did that very well. I knew that the discussion section was going to go last. CM: Why include some essays that had already been printed elsewhere, such as the Martha Nochimson essay from Film Quarterly, or the Diane Hume-George essay from Ms.? 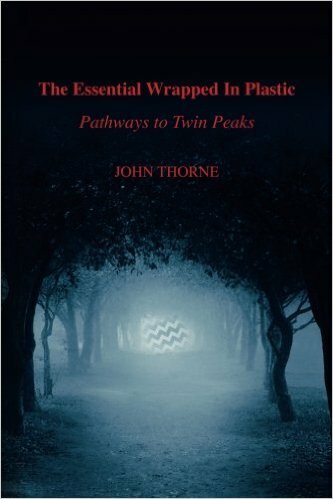 DL: Some of those were so well-known that it seemed a definitive book on Twin Peaks should include them. I think about 75% of the book is new material. Jonathan Rosenbaum's essay was published elsewhere. And of course he does not like Lynch. JT: Why did you choose the Rosenbaum essay, a negative article, to lead off the book? DL: Rosenbaum's first for sales. I worried about it, but Rosenbaum's such a big name. He's done about ten books and he's one of the really well-known film critics. Of course, that's the only essay that's totally hostile. I tried to get Rosenbaum to write an updated essay, because his is basically a review from when Twin Peaks first came on. I don't agree with Rosenbaum, either. I put it first, partly to get it out of the way. It's a very short essay. You have to remember that he is not a life-long "hater" of Lynch. He happens to think Eraserhead is one of the greatest films ever made. Rosenbaum has always been an avant-garde film advocate. The point he makes is that Lynch has never had to explain why things happen in his movies. Would Lynch have explained why the lights are flickering in the morgue if that scene was in Eraserhead? Nothing is explained in Eraserhead! It's good enough that it wasn't explained. His argument is that there has been a gradual coarsening of Lynch. JT: Fire Walk With Me doesn't get as much attention in the book as the series. DL: That's mainly due to logistics. The essays were written before the film came out. I asked the authors to include anything they could about it for their final revisions. I included a few things for my introduction, but there's not much else. JT: Opinion of the film varies dramatically depending on who you talk to. What did you think of it? DL: I thought it was interesting, but I was greatly disappointed by it. It was only after I read the Video Watchdog essay that I thought I could convince myself that I really liked it. I did go see it again and I liked it better. A lot of people hated it, though. I did include a plot summary of the film in the book, but I had a student do that. I just couldn't force myself to sit down and do it. CM: Were you disappointed because they did a prequel, or did you think the film just wasn't well made? DL: Well, there was just so much missing. The humor, that wonderful leaven that was there in the series, was gone. Suddenly it was this incredibly depressing, heavy-handed film. There's still a great debate about the ending, which I know you guys liked and Video Watchdog liked. But I disliked the ending about as much as I disliked the ending of Wild At Heart, of which it was a virtual clone, with the angels descending and all of that. That's when I think Lynch is at his absolute worst. Like anybody I wanted to see the story continue. I wanted to see Cooper get out of the bathroom. And I guess he's never going to. JT: But in many respects the fact that Cooper has been possessed by Bob is an ending. The evil has, perhaps, been victorious. DL: Yeah, but we still don't know what happened in Pittsburgh. If you read the Cooper Autobiography it’s pretty clear that Cooper may have killed Earle's wife. That's something I suggest in my introduction. CM: You suggest that maybe Bob had entered Cooper at an early age just as he had entered Leland. DL: We shouldn't work under the assumption that Bob is only in one individual at a time. I mean, Bob could be inhabiting various beings at various times. Just because he was in Leland doesn't mean he couldn't have been in Cooper. CM: But there's no evidence that he can do that. DL: But Bob knew all about Pittsburgh. JT: Somebody once suggested [to us] that maybe Bob's ultimate goal was to possess Cooper. He orchestrated this entire thing--including Windom Earle and Laura--to get Cooper to that certain place and point in time where he could possess him. DL: As an English teacher, though, if you came to me in a literature class and suggested that theory, I would say, "What in the text leads you to say that?" I think it's a fascinating hypothesis, but there is nothing in Twin Peaks other than a bunch of strange conjunctions that would lead you to believe that it was true. I don't doubt for a minute that it might be where the story was going, but if you don't find some evidence for it in the text, it doesn't make any sense. JT: Well, excluding the Cooper Autobiography--let's just say only the series is the text--are there any clues that lead you to believe that Cooper was possessed by Bob at one point? DL: That Bob knows about Pittsburgh. How does Bob know about that? JT: I might interpret that to say Bob had been possessing Windom Earle. DL: Well, we don't know his relationship with Earle. I mean he dispatches Earle so quickly. Earle has been this menacing figure for all these episodes and then he's done away with so quickly in the Black Lodge. That was one of the disappointing things about the last episode. Do we know that Lynch and Frost knew? Did they have it sketched out? JT: Frost has said that they he had a vague idea of where they would go in the third season. DL: We're talking wing and a prayer here anyway, aren't we? As Dolan shows, they were making this up as they went along--to a great degree--because they never knew how long the show was going to continue. They had to leave it open-ended enough so that they could continue it. DL: And which is it? Or could it be both?